My college friends were planning-out a visit to Shirdi, the home to the famous Shirdi Sai Baba. 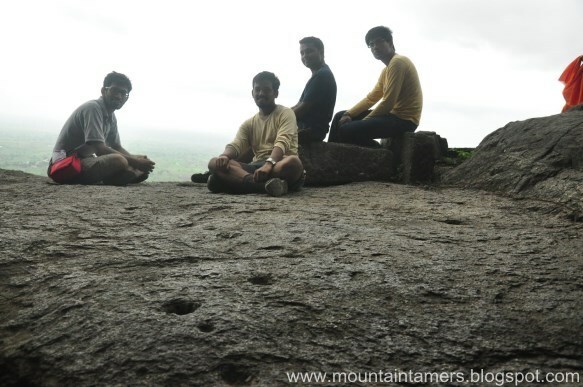 This was probably my last weekend in India and hence I wanted it to be combined with a trek to nearby region. Possibly, a one with night-stay at the top of any fort, be it in a cave or just open ground under five billion stars. And thus a unique combination was born! About the group: Aaditya and Abhash were already waiting at Dadar station. 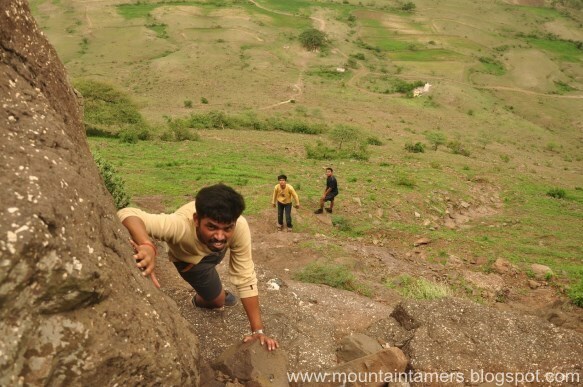 But about Ninad, I can write a whole book on how we had to persuade him to join the trek. But finally he made it, and thats what counts. Bhavesh, Suresh, Milind, Niket were going to be with us till Shirdi. Started from Dadar. We had booked a bus via private travel-company from Dadar. We left at 11 PM. The rash driving by the driver and the chilly winds on the Nashik highway were quite good reasons to keep us awake till 6 AM. We reached Shirdi at 6.45 AM. The city looked quite different than I had imagined. It was unusually less crowded and looked somewhat well-organized. One thing was common though and it happens outside almost all famous temples. We got tricked into buying the prasad from the nearby shop where we kept our bags. भगवान के नाम से blackmail किया हमे. म्हणे, "थाळी घ्या नाहीतर तुमची पुढची कामे नाही होणार". विचार केला, आलोच आहोत इतक्या दूर तर घेऊयाच प्रसाद. पुढे ट्रेक पण करायचाय. We kept our heavy luggage with them but not our phones and stuff. There was another place nearby the entrance which was meant for keeping such things. There was a huge but well-organized line for Sai baba darshan. The queue proceeded slowly an we killed the time chatting, chanting shlokas etc. After the visit we went to the prasad bhojan hall, which is a short walk away from main temple area. The food was good and served as a perfect diet which was very much needed for the long trek ahead. The time was 12.30 PM when we decided to leave for second phase of our journey. The initial plan to buy the ladoo (प्रसादाचे लाडू) was abandoned due to the long queue and we had to satisfy ourselves with a kilo of guava fruit. The bus station at Shirdi is quite a happening place. It has a good frequency of buses plying to the major places around Shirdi, Nashik, Manmad, to name a few. 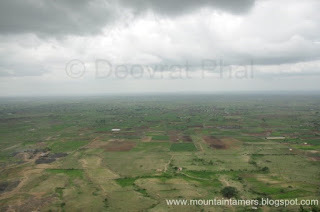 Manmad (मनमाड) is a city, very close to Shirdi and is well connected by SH10. We got into a 12.45 PM Manmad bound bus and found ourselves good seats to take a good nap before the trek. It was going to be an hour and half before we reach the Ankai-killa station (अंकाई किल्ला स्टेशन). Yes, there's a railway station where passenger trains hardly ply, and are unusually delayed, by like 4 to 8 hrs. You can see and hear the goods-train (मालगाड़ी) passing on this track. 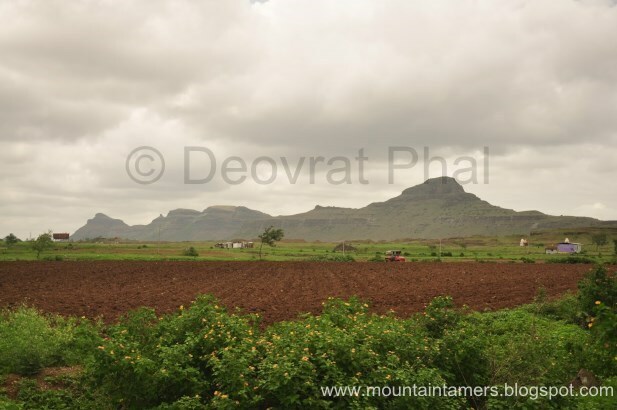 The highway passes between the mountains and proceeds to Manmad city. 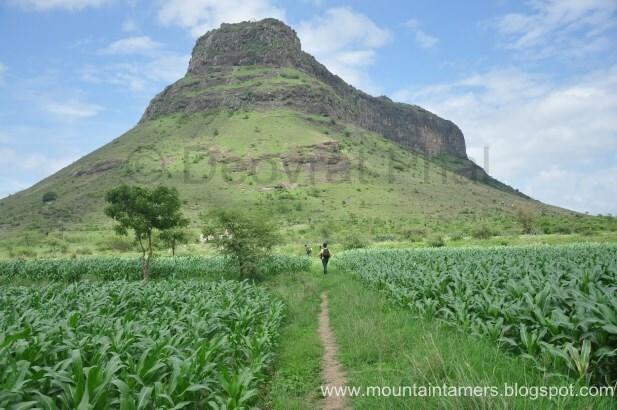 We can see the Hadbi-chi-shendi pinnacle on our left side. The bus conductor made us get down a kilometer before our destination so we had to walk till the Ankai-killa railway station and then we met the road going towards Ankai village. Ankai, Tankai, Gorakshnath and a series of mountains are part of Satmala range extending from west to east. 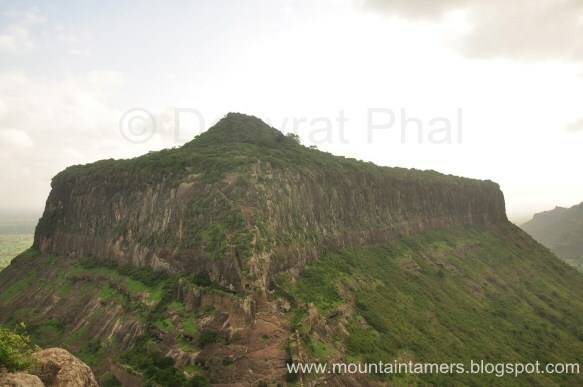 The pinnacle- Hadbi-chi-shendi (हड्बी ची शेंडी) or Khada Parsi (खडा पारसी) is an amazing place for rock-climbing. A decade before, there was no highway to reach these mountains and pinnacles and one had to walk all the way from Manmad to reach Hadbi-chi-shendi (Info. provided by my father). The highway doesn't destroy any part of the monuments, it looks like it, and it perfectly dodges the surrounding mountains. I must say, this highway looks truly marvelous from the western end of Ankai fort (from the top). 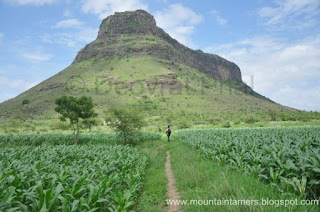 We made our way through the corn fields to reach the small tar road traversing the Ankai fort. The route to Ankai and Tankai is same till the col joining both the forts. 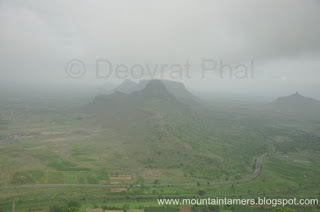 There is a striking contrast in the geography of this region as compared to the ghats and konkan region. 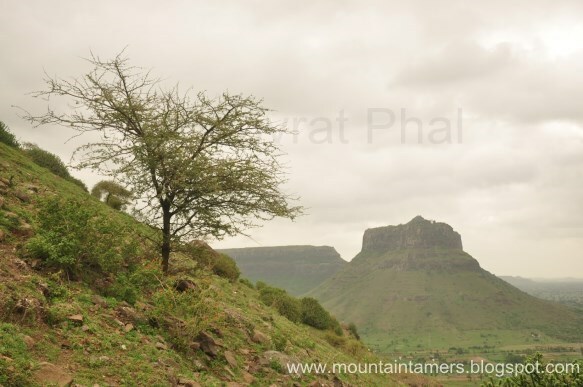 This region receives a scanty rainfall because of which it is hard to find much of greenery in this region. The vast expanse of flat land extending to south of these twin forts gives a glimpse of the hardships these people have to face during strong summers. There are very small amount of trees present in this region and even a smallest of them helps the traveler to rejuvenate under its cool shade. We entered the village at the base of the village and knocked a door to ask for water. A lady in her 50's opened the door and started talking in Marathi (the version which was very difficult for us to understand even if our mother-tongue was Marathi). We filled all our bottles we had. While chatting we got to know that their children were working in Thane district, which is close to Mumbai. They were happy indeed when we left their home. The well maintained steps will take you from the start to the col where the two forts (plateau) are dissected. 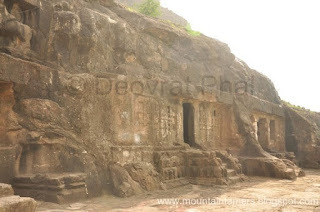 On the way there are a series of rock-cut caves (लेण्या) belonging to the Jain period (Source: Internet). 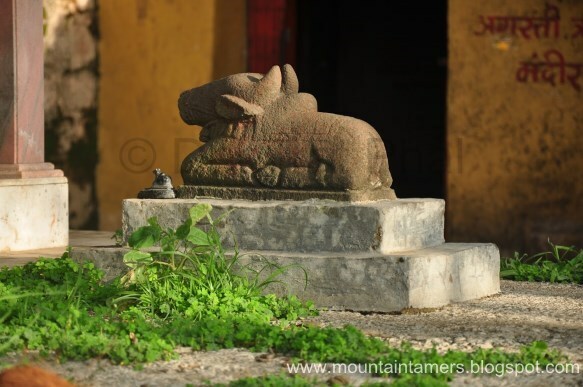 They are located at the base of Tankai fort, and can be seen after the start of the trek before the col. There was a peculiar silence all along the trail till the top. The swallows, dove, bulbuls, magpies broke the silence at several times. We couldn't see any monkeys though. I thought it was past their office time. 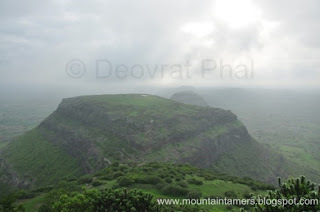 Tankai fort is like a mesa, meaning, an elevated area of land with a flat top and steep cliffs. 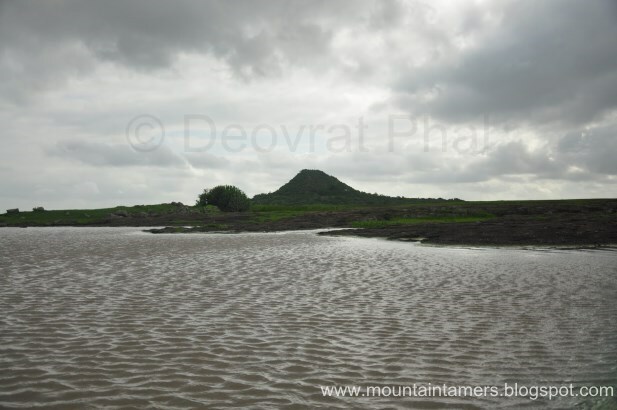 These landforms are a characteristic of arid environments, particular the Satmaal range (सातमाळ डोंगर रांग). The entrance to the fort falls on the same side as the ridge joining to Ankai fort. 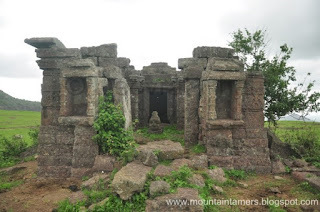 Places to lookout-for at the top include the following: A series of rock cisterns, remnants of standing structure, shakey main entrance, a small dargah at the entrance, couple of water cisterns (with cattle-skull and bones in it), Pandav temple, Shiva temple with a Nandi, a huge squarish lake and commanding view of the neighboring mountain ranges to the west (beyond Ankai). 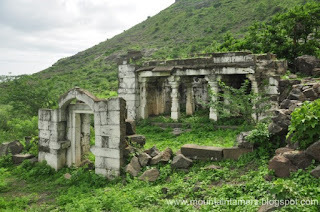 To the east side, if the skies are clear and if you have a good eyesight, you can see a dargah/temple painted in white at the top of the mountain. Its dome was shining brightly in the afternoon sunshine. The route from the col mainly consists of the verticle climb with many entrance doors and carved-steps. 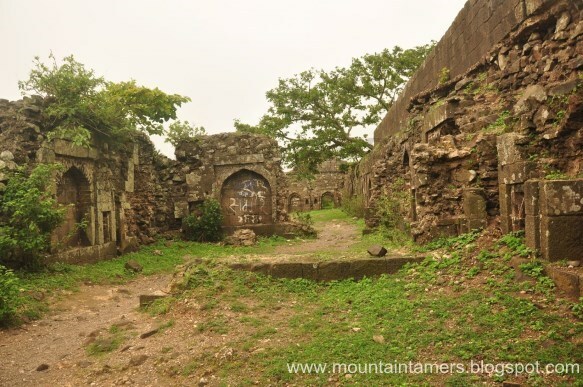 At every stage, Tankai fort lies on your back side while climbing the Ankai fort. Ankai killa is the home to Agasthi Rishi Ashram. An old sage and a disciple looks after the place and have well maintained the ashram. We used the water tank right next to the ashram for drinking and cooking purposes. We found many caves once we reached the top. 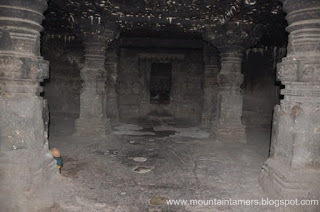 but the Sita cave or (सीता गुहा) was clean and we were offered to stay in this cave by the disciple of Sadhu-baba. He even gave us a candle and a match-box to light the fire by night time to cook or just to keep ourselves warm. We took the resources and decided to spend the remaining evening outside the ashram. 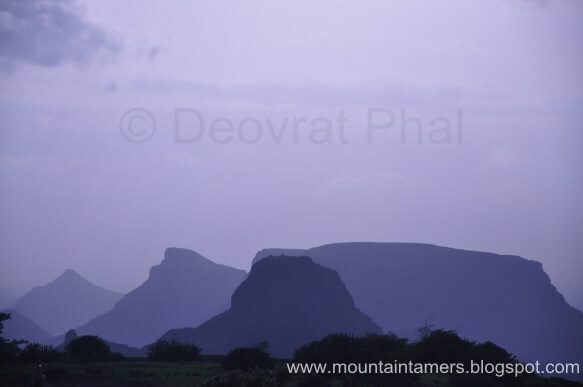 At 6.00 PM, the pre-sunset light crept all across the surrounding forts and mountains. At times, the swallows and larks broke the silence to inform us about their presence. 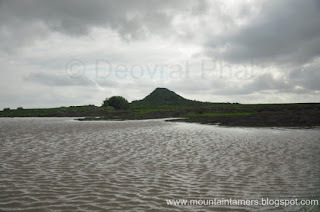 We could hear the fading harmonics of the unknown marathi music from the far-off house in the direction of Ankai village. 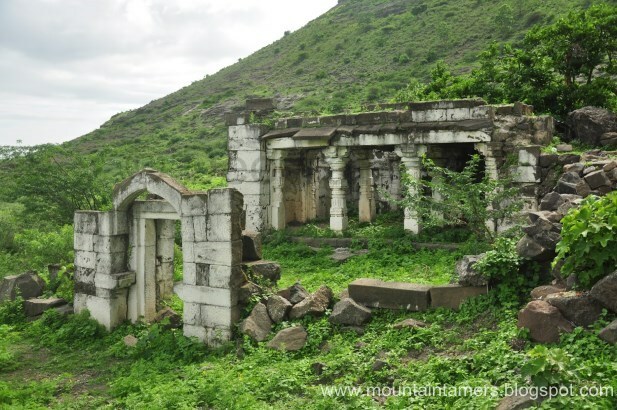 Outside the Agasthi rishi ashram, we four were soaking in the terrific uninterrupted natural beauty of the Ankai fort, with pleasant breeze blowing against our foreheads, taking away our tiredness and calming all the neuro-senses. We got up at 6.30 AM, early enough to catch the first sun-rays, that touched the entrance of the cave we were staying in. Small breakfast of ladoo and thepla was sufficient to get us started. We started toward the highest point of Ankai. A small 7-8 ft rock climb is the final frontier and the view from the top was mesmerizing. We could now see the full span of the railway tracks- and the train making its way from Manmad, and going in the direction of Shirdi. The surrounding region is a huge flat plain-land and we could capture the whole view, the panorama (not the phone feature, but the panaroma literally). We could monitor the surrounding region from above up there. 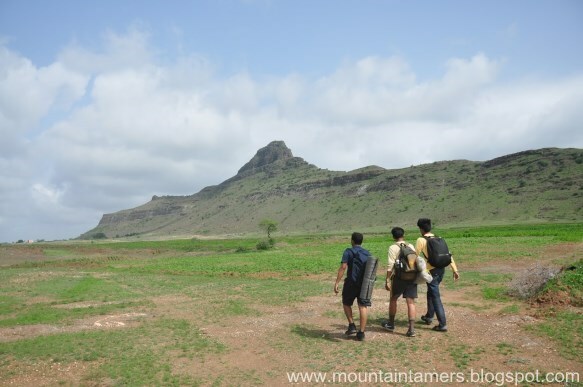 On the other side (facing Tankai fort) we could easily spot the fellow trekkers making their way up through the main entrance of the fort. The grazing herd from the previous day which was near the huge water tank on Tankai had clustered at one end. The wind was strong enough to prevent us from taking the pictures. But we managed a few. We climbed down from the side from where we can see the temple (ashram) and proceeded to explore the west side of Ankai fort. After exploring every nook and corners of Ankai we came back to our shelter. Almost everything was wrapped up and we did the final packing of our stuff and tightened the carrymats to our ruck-sacks. It was time to move on to next destination i.e. Gorakshnath (गोरक्षनाथ डोंगर). Started the climb-down from Ankai at 8.15 AM. 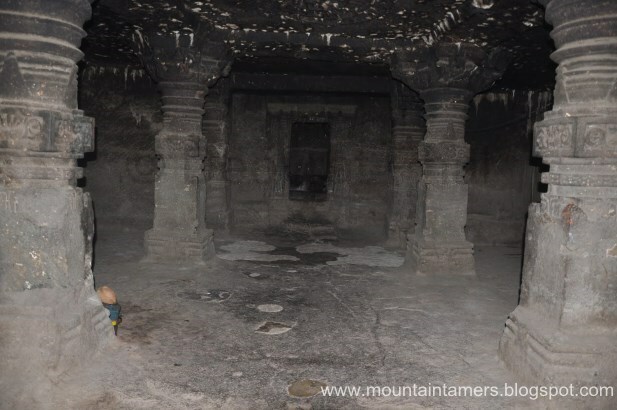 Plan was to reach the Kanifnath cave (कनिफनाथ गुहा) on the Gorakshnath mountain and return to the base at Gufeshwar Mahadev temple (गुफेश्वर महादेव मंदिर) before clock hits 12 in the afternoon. We encountered many monkeys while climbing down the Ankai fort. A group of teenagers were trying to piss them off. 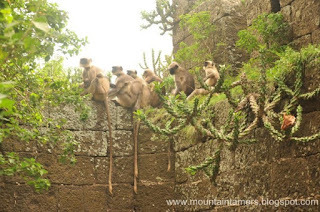 At that time, it was hard to differentiate between the teenagers and the monkeys. We had to ensure our bags were properly packed and no eatables were kept outside. The descent was quick and we reached the col in 20 minutes. We spent half an hour exploring the rockcut temples and caves which we had missed the other day. And were back on the tar road going outside the Ankai village. A kind milk-van driver offered us a lift till the SH10 highway and later we moved on to Gorakshnath mountain base- Ambewadi. We took a smart short-cut to the base. The area is dug-up and there were huge pits surrounding the quarry and we could see the dumpers going in and coming out of the quarry. We followed the route close to the mountain and in the direction of the temple. A huge tree is visible from far distance and the temple is pretty near to that tree. The rock-patch. The temple can be seen in the background. The steps are now broken and it took us quite some time to find out that the rocky trail was actually our route to the top. 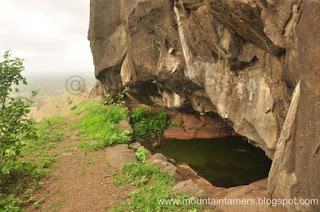 Well, not the actual top, but to the caves which lies somewhere below the actual summit. There are many trails which may take you to the small hills to the left. But the path to Gorakshnath is somewhat straight except for a few short zig-zags. After the small and easy rock-patch of about 6 ft. the path breaks down into two. The right one climbs to enter first set of caves (at the end of the path). The second one i.e. left goes to the another set of caves and rock-cut cisterns. 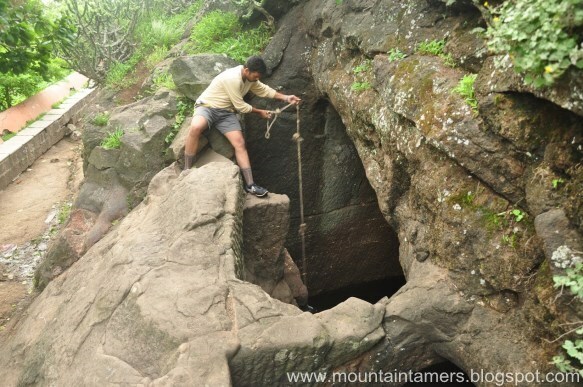 The path to the last cave/water cistern is exposed and the fall to left hand-side is quite big (almost height of mountain). We took extra precautions to visit this cave. 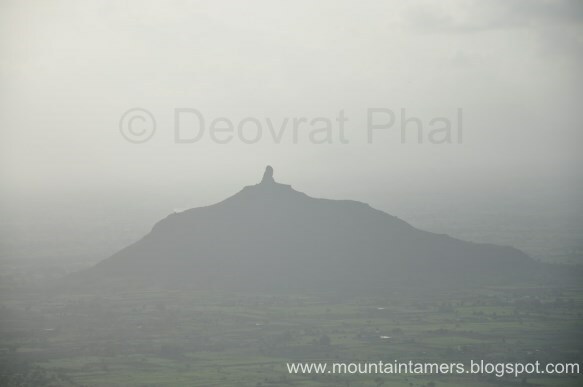 The climb down was quick and we reached the Gufeshwar Mahadev temple in 20 minutes. The sadhu baba who looks after the temple had arrived (on his bullet!) when we were climbing the mountain. He offered us tea and snacks and said that it was a prasad and we don't charge for prasad. To describe in marathi- प्रसादाचे कसले पैसे देता ? We did feel a bit embarrassed at that moment. The time was past 11.30 AM. It was time for hitchhiking!! Waiving arms to random vehicles to drop us till Manmad. A truck stopped for us and we happily jumped in and reached Manmad in another 15-20 minutes. We decided to visit a Gurudwara in Manmad to kill time till our train arrived. We had glass of juice each at a local store. All the trains were delayed that day. Manmad is well connected by long-distance trains and we were lucky to catch a Dadar bound passenger train. Ankai fort height is 3170 ft.
Tankai fort height is 2818 ft.
Gorakshnath height is (डोंगर-तिर्थक्षेत्र) 3052 ft. These three mountains, along with other mountains in this range can be trekked in 2 full days. Ankai-Tankai can be done in one day itself.